One of the most frequently used reasons given by proponents adding fluoride to drinking water is that fluoride has been used for over half a century and it must, therefore, be safe. Another favorite argument is that fluoridation is endorsed by government “experts” and dental professionals, so it must be safe. If we followed this logic–that long use and recommendation by experts makes things right–we would still be smoking cigarettes to improve our health, as the American Medical Association for some time recommended; mothers would still be advised to get their infants on formula as soon as possible, because (according to the AMA in the 1950s) breast milk is not adequate nutrition for babies; we could forget worries about dentists putting poisonous mercury fillings into our mouths (they have, after all, been doing it for 150 years, so it must be safe); we would still be driving cars with gasoline that spews lead into the environment; the water pipes to our homes would be lined with asbestos, since that was the piping recommended by experts for decades; our children would be playing in the white spray emitted by DDT trucks spraying for mosquitoes, which experts once told us was absolutely safe; and, doctors would still be applying their favorite treatment, draining out blood, for virtually anything that ailed us, for the world’s leading medical experts did just that for some 2500 years. 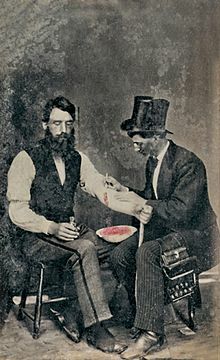 Bloodletting was still going strong at the time of this 1860 image. It was widely practiced in the 5th century BC, and it was the main treatment strategy at the time our first president George Washington was bled to death by the best medical minds of the time. Shouldn’t a treatment 2500 years old and praised by the greatest physicians throughout the ages be used today? There may be good reasons why fluoride should be added to public water supplies, but the recommendation of dentists and decades of fluoridation are not among them.